KEEP CALM AND CARRY ON. It’s a pithy piece of advice, but, let’s face it, curling up in a fetal position might seem the more natural response when life goes awry. Two USC law students, one a third-year and the other a May 2015 graduate, share their stories of resilience and grit in the face of extraordinary challenges. In their lives, we catch a glimpse of what it takes to overcome. Stephanie was a high school dropout, divorced with a young child when she suddenly decided things had to change. I’m 31 and I’ve moved over 30 times in my life. My parents have 13 marriages and divorces between them. I stayed with my dad until he got married again — she didn’t like me — so I went to live with my mom. There was domestic violence; he beat her, hit us kids. We lived in a one-bedroom, Section 8 housing. There was no hope of my life going anywhere. My mom didn’t graduate high school; I didn’t graduate high school. I’m 10 years older than my three younger siblings so I stayed home to help take care of them. I just quit going to school. Then I met a boy, got pregnant at 17. It was kinda the thing in our family. So we got married, moved to Hawaii. What do you know at that age? It bothered me not having a high school diploma. I remember being so insecure about everything. None of that matters. I tell the story loud so that people know: It does not matter. I got a job at an attorney’s office as a secretary. I’m answering phones, I’m bored. So I start reading through files. I go back to the attorney and point something out, and she was like, “Oh, my God, I never thought of that. Go type that up.” And eventually she says, “You are more than what I thought you were going to be. I want to help you go to law school.” And I was like, “Me? Law school?” So I signed up for the LSAT. I didn’t get one rejection. The character and fitness part of the bar attracts me. I don’t take that lightly. I feel so proud to be entering a profession where you are judged on your character. I mean, that’s awesome. 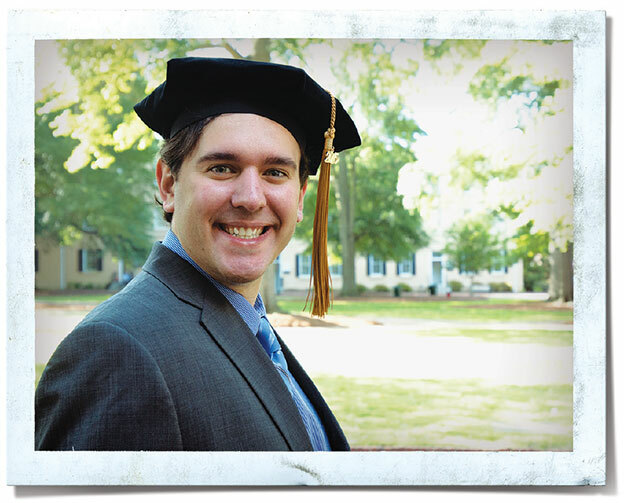 Nick learned he had a brain tumor halfway through law school and decided to concentrate on finishing his studies before beginning treatment. Sunshine and scholarships, those are the two things that brought me here. On Dec. 23, 2013, I was with my girlfriend at a Dairy Queen in Pittsburgh. I experienced what you would call an aura, a kind of downgrade in my consciousness. I thought I was having a stroke. I asked a patron in the restaurant to call an ambulance and my girlfriend to call my family. And about that time my left arm started to fl ail. The two answers that came back were multiple sclerosis or a glioma. I had no idea what a glioma was. But I could tell that it didn’t sound good. They wanted me to start treatment right away. I had gotten so far through law school, I came back and told my neuro-oncologist, “I’m finishing up, you guys can do what you want.” If I decide I want to do something, I’m going to do it. That’s how it was with getting through law school, but I wasn’t able to get it done without the help that’s been given to me. The median survival for someone like me is probably something like 14 years. That doesn’t sound like a whole lot, but it’s my life and it’s time that I value a great deal. I know that there are some incredible things that are coming down the pipeline. When you and I look a month out from now, I’m looking at it the same way that you are. When we look out 10 years, I’m starting to wonder where I’m going to be. I don’t know if I’m going to be fully functional. I don’t know if I’m going to have a motor disability. My girlfriend has been so supportive through three years of law school and the whole ordeal. I full out said, “If you don’t want to go through with me on this, I would completely understand.” And she came back so adamantly that she wanted to be by my side. There have been so many tears through all of the ups and downs, but at the same time we’re pretty strong. Don’t get me wrong, the whole backdrop of what can happen to me in the future is something we don’t like to think about. You’re forever changed, but I think some of the ways we’ve been changed are pretty good. I’m more worried about radiological damage rather than what the tumor is doing. They think that in my specific case memory is not going to be so much of an issue, but they worry that my ability to serially process information quickly is going to be hampered. It’s weird to face that possibility of degradation in your mental faculties. If I do something dumb, the people who really, really know me can poke fun and blame it on the tumor — and I’m good with that. You see things and laugh at things that you otherwise wouldn’t find humor in except for the place you find yourself in. I’ve heard stories of people who had family members or friends taken from brain cancer. And I see that they’re still going strong, and I like to think that the person they lost still lives within them. That gives me hope for my family, for my friends, for my girlfriend — that whatever happens to me, they’re going to be OK.
Stephanie Smith completed a summer 2015 clerkship with the 14th Circuit Solicitor’s Office in Beaufort, S.C., and is currently interning with 2nd Circuit Judge Arnold Early. Nick Luft is recovering from treatment at Duke Medical Center. He completed the Pennsylvania bar exam earlier this summer. This entry was posted in Fall 2015 on 23 October 2015 by Rob Schaller.